"I'm not your boyfriend." He's speaking to Clara when he says it, but the Doctor might as well be speaking to us. His incarnations have all been young and dashing since Doctor Who returned to our screens in 2005. And while his dark side has surfaced from time to time (helloooo "The Waters of Mars"!) for the most part he's kept it hidden beneath that veil Madame Vastra talks about. His youthful looks. His charm. His need for acceptance — especially in the wake of the terrible deeds he committed during the Time War — which just so happened to come at the exact same time he needed an audience to fall back in love with him after 16 years of being cancelled from television. But now he and the show have spent the better part of a decade coming to terms with the Time War and establishing themselves near the top of the ratings. He doesn't need to flirt with us anymore. In the last few months, there's been lots of talk about a darker feel for Doctor Who this season. And the premiere certainly delivered it, along with a much more mature tone. The direction from Ben Wheatley let the story unfold at a calmer, less frenetic pace (maybe not surprising from a director whose most recent film was a black-and-white movie about guys in the 1600s getting stoned in a field) and the script was full of disturbing images. 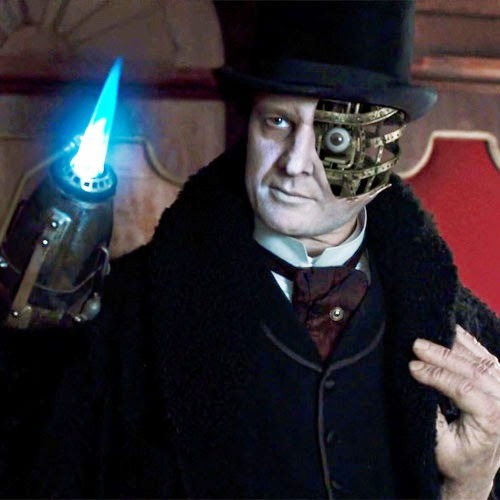 We'd seen the clockwork androids before, of course, collecting human body parts in order to repair a spaceship in Season Two's "The Girl In The Fireplace". But their return was even more graphic than that. This time, the androids themselves were a Frankensteinian jumble of corpse bits. Clara wore some dead guy's face. A hot air balloon made of human skin floated by St. Paul's Cathedral. A body was impaled on the tip of Big Ben. A dinosaur burned alive in the Thames. Not only that, we also got the darker Doctor we've been expecting ever since Malcolm Tucker Peter Capaldi was announced as the man who would be taking on the role. Older. Greyer. Short tempered. Less immediately loveable. Doesn't like hugs. Even his accent marks him as an outsider. In his very first episode, he abandons Clara three times, insults her more times than that, intimidates a tramp — might even have stolen the man's coat — and in the end we're left wondering if he murdered a robot. (And not just any robot, either, but a droid the Doctor himself says is "barely a droid anymore... more human... than machine.") That kind of darkness has been a part of our favourite Time Lord since the beginning — he almost murdered a caveman in the show's very first episode — but the Twelfth Doctor is easily the most unsettling new face we've been... uh... faced with since the Sixth Doctor tried to strangle his companion in 1984 and began his slow descent into cancellation. For the first time in a long time, it feels like we don't know who the Doctor really is. He's truly unpredictable. 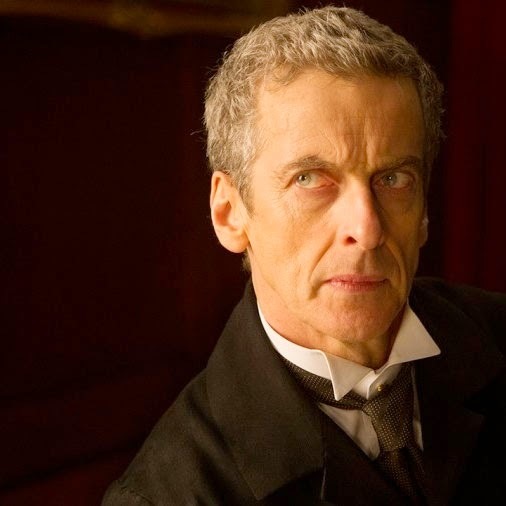 In interviews leading up to the premiere, Capaldi talked about wanting to inject a sense of mystery back into the character. And so far, he's succeeded spectacularly. Even the Doctor himself seems thoroughly disoriented. In his last moments as the Eleventh, he promised, "I will not forget one line of this, not one day, I swear." But he's already broken that pledge. In "Deep Breath" he seems to have plenty of trouble remembering who he is. At one point, he accidentally raises the question of whether he can properly consider himself to even be the Doctor anymore. When he confronts The Half-Face Man with the paradox of The Ship of Theseus — "is a thing still the same thing after all its parts have been replaced?" — the question applies just as much to The Man With A Dozen Faces as it does to the man with half a face. "You probably can't even remember where you got that face from!" the Doctor declares, not realizing until the words are already out of his mouth that he pretty much said the same thing about himself earlier this very same episode. By the time it's all said and done, Capaldi's debut raises deeply troubling questions about everything Matt Smith said during the reassuring speech he gave in his own final moments. And as usual, the questions you raise about the Doctor can apply equally well to the show itself. Is this really still the same show as when it first debuted? Is it still the same show it was at Christmas? "Doctor Who is changing, has changed," Chris Lough wrote in his review for Tor.com, "and by the end of 'Deep Breath' is not a show you'll recognize as Doctor Who." A regeneration is unsettling enough as a viewer. With a change of tone and an abrasive new Doctor, it's even more disturbing. And this time, there's no charming fish-custard to ease us through it. Instead, there's a human skin balloon. As Lough says in his review, "you’re not going crazy, this is all really weird and kind of upsetting..."
But as he also points out, there is one source of relief: "Clara's there to confront it with you." We spent half of Season Seven trying to solve one big mystery: who was Clara Oswald, the Impossible Girl? Instead of the companion being "the asking questions one," as the Doctor puts it, she was the question. And it was the Doctor who was asking the same questions we were. But his regeneration has reversed our relationship with the two characters completely. Now, for the first time, Clara is playing the role the companions usually play; in the blink of an eye, she's become the one we identify with. And while the Doctor disappears for a good chunk of the beginning of "Deep Breath", we get to know her a lot better. That one spat with Madame Vastra does more to flesh out Clara's character than ten whole episodes did last year. The Doctor is back to being the mysterious one. And so, in the wake of the 50th anniversary, it seems that we've returned to the central question the show started out with all those years ago: "Doctor who?" That mystery was bubbling in the background for most of last season — and for a few brief moments in Matt Smith's final episodes, it seemed as if Clara might have finally found an answer. But then he goes and changes his face and it's like we're back in 1963 all over again. Which is, of course, what makes it so much fun. - Lough's review also nails many of the episode's weakest points: "Everything you dislike about Moffat’s writing is in 'Deep Breath,' unfortunately. Repetition of ideas, repetition of phrases to instill horror, stupid jokes about gender, needless insults about gender, etc." - The new credits! They're based on credits made by a fan of the show who posted them to YouTube, caught Moffat's attention, and then was hired to work on them for real. Which is so cool. You can check out the original version here. - The tramp was played by Brian Miller, who was married to Elizabeth Sladen, who played Sarah Jane Smith. - Exciting to see that the Doctor seems to recognize his face. He met a character played by Capaldi in Season Four's "The Fires of Pompeii" and Capaldi also played a character in the "Children of Earth" season of the spin-off series, Torchwood. Hoping this turns out of be one of Moffat's good mysteries. - Mirrors! So many mirrors! - "I'm not flirting by the way," the Doctor clarifies (to the dinosaur). After all the talk about how the Doctor wouldn't be flirty this time around, I loved that. - I also loved the way the Doctor seems to identify with the dinosaur, slipping from his sleeping translation of the dinosaur feeling lost and alone into words that echo his own later lines about Clara not seeing him. - And a third thing I love: that while the Doctor is trying to remember where he knows the clockwork androids from, he takes a long sniff of the blonde yellow roses he's holding. Doesn't seem to help. That companion was a lonnnng time ago now. - I also really like that Vastra's anger at Clara can double as anger at us — but even more that Clara's outrage at Vastra can double as a defense of all the "fangirls" that people have been too quick to assume would fall out of love with Doctor Who now that the Doctor is played by an older actor. In fact, I saw self-described fangirls express those very same feelings in the comments to reviews of this episode. - The Missy/heaven stuff at the end. It seems to be, interestingly, the exact same garden Amy discovers at one point in the Two Streams Facility during "The Girl Who Waited". And there's been lots of online speculation about who Missy is: The Master? River? Tasha Lem? Idris (the personification of the TARDIS)? Romana? The Rani? Someone new? (Which is pretty much what everybody wonders every time Moffat introduces a new female character.) In any case, it looks like whatever we think of the Missy storyline (and so far I think "ugh") this will definitely be the overarching plot of Season Eight. The name of the season finale is "Death In Heaven". - "You've redecorated. I don't like it." Clara's line to the new Doctor echoes back all the way to the Second Doctor saying the same thing in "The Three Doctors" from 1973. - "O Captain! My Captain!" The Doctor refers to the Whitman poem when he sees the Half-Face Man sitting on the buried spaceship. We know it best these days thanks to Dead Poet's Society (RIcoincidentalP Robin Williams), but the poem itself is pretty morbid: a ship returns to port after a successful voyage, but the Captain didn't survive. He lies dead on deck. - Clara's first theory for the organ-stealing is Burke and Hare from space. The Burke and Hare murders happened in Edinburgh in the 1800s — they sold the corpses to a doctor to be used in his anatomy lectures. - Lots and lots of Sherlock Holmes references (which makes sense given that Doctor Who showrunner Steven Moffat also runs Sherlock and that we've been told Holmes was based on Madame Vastra): the Pasternoster Irregulars, Inspector Gregson, "The game is afoot! ", the peg board, Jenny's reference to the Conk-Singleton forgery case... all shout outs to the Great Detective. The BBC has a more detailed breakdown here. - Lots of people seem to be disappointed that Clara seems so deeply thrown by the regeneration given that she has met so many Doctors before. We do know, though, from the anniversary special, that she doesn't really remember what happened inside the Doctor's timeline. And I totally buy that she'd still be thrown by the older, abrasive, seemingly broken Doctor that she gets. There was a fantastic discussion from both sides of the issue on the Verity! podcast this week. You can check it out here. Head to about the 38-minute mark if you want to skip straight to that bit. - We were promised a feel more in line with classic Who — and even the Doctor himself makes a reference to wanting more rounds things on the walls of the TARDIS. - By the way, I totally think he killed that clockwork droid. It seems much more likely that the Doctor is lying (rule #1) than the android is lying. And we know murder isn't against his basic programming: he's killed people as recently as, say, Solomon the trader in "Dinosaurs on a Spaceship". Read our next recap of the next episode: Doctor Who & The Question of the Good Dalek. Or the previous episode: Memory & The Doctor Who Christmas Special.